Has ‘Veganuary’ given your kitchen food for thought? It may be for a health kick to start the year, or it may be because they really want to commit to a new lifestyle – whatever their reasons thousands of people signed up to take part in this year’s Veganuary. Vegan eating certainly gained momentum throughout 2018 so it is no surprise that large numbers of people signed up to take part in the charity initiative this January. While Veganuary focuses on the ethics of veganism, the health aspect of the vegan diet has also been a major part of its appeal throughout the last year. But what does this increased appetite for plant-based diets mean for commercial kitchens? On the upside more scope for offering vegetarian meals could mean less meat waste if that is a problem you have experienced in the past as a result of the stringent rules that apply to fresh meat. Storing and preparing vegetables and pulses is, as a general rule, a lot simpler. Of course for many establishments catering to the growing vegan population will mean extending their menu to accommodate greater choice. However, offering vegan meals does mean that some customers may ask questions about the preparation of their meals, which may possibly mean needing to consider introducing a vegan preparation area, free from dairy, eggs and meat. While vegan cooking can still be seen by many as a challenge, vegetable dishes do also bring the potential to really offer something different on the menu. 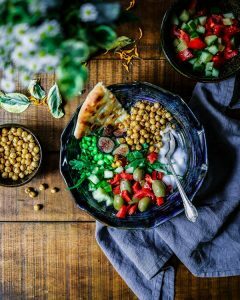 Many standard dishes can be altered to become vegan, but an emphasis on vegetables and pulses as a base also brings an added level of creativity to cooking. Many new vegan enterprises pride themselves on cutting edge vegan dishes, with previously unassuming vegetables taking centre stage. Spicy buffalo cauliflower wings, smashed avocado on toast, vegan mac ‘n’ cheese, chickpea and spinach curry – popular vegan dishes certainly prove that variety is the spice of life. With a greater emphasis on health customers are also quite likely to make vegan meal choices even if they do not follow a vegan diet. With endless media interest, thousands jumping on board with Veganuary and the climate and health benefits winning diners over, vegan food is a trend that looks set to continue growing. To add additional preparation equipment or storage to your kitchen contact Caterline Ltd.